2016 Reprint of 1950 Edition. Full facsimile of the original edition, not reproduced with Optical Recognition Software. Along with many others of the depression era Franlin Hall grew up in rural poverty and was deeply religious. Initially he was with the Methodist church but their stance against healing forced him elsewhere. During the depression and World War II he travelled as an independent evangelist. In 1946, he published a brief book entitled "Atomic Power with God through Prayer and Fasting." The book, which provided detailed information on the methods and benefits of fasting, was an immediate success and brought Hall considerable fame. According to Hall, all of the major evangelists began following his fasting regime and miracles erupted everywhere. Many observers of the early revival years agreed, as one said, "Every one of these men down through the years followed Franklin Hall's method of fasting." This is a powerful book on fasting - the whys and wherefores, and how to go about it. After reading this book, I was 100% ready to go. The problem is there is not enough cautionary information on what to do if you encounter trouble. In my case, I developed intestinal pain, and should have aborted the fast much sooner than I did. It turns out the fast had uncovered problems with gallstones that were affecting the pancreas and intestines, and ultimately the kidneys. This ended up being no small problem. 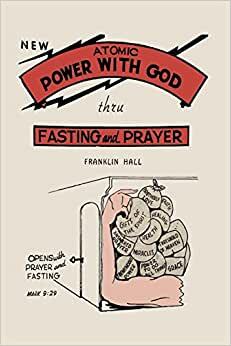 I would recommend you supplement this book with something like Bill Bright's fasting guidelines, which you can find free online, or actually buy his full book. Between "Atomic" and Bright I think you'll have a more complete preparation going into a major fast. I also think it's a good idea to start slow if you're not used to fasting, or your body is not in great shape, or you're older. Go on a juice fast or a cleansing fast first, see how it goes, and then graduate to a water-only fast. Do it for a short time at first, and carefully gauge how your body is reacting. I am convinced by this book that fasting is a powerful discipline sorely neglected by Christians today. But make sure you go about it safely and correctly. This little book inspires people to embark on a 40 day fast. Hall provides very practical information about the different stages of the fast and what people can expect during those stages. He also reveals the purification process that a long fast accomplishes, setting people free from a variety of afflictions and bondages. The end result is power. Prolonged seasons of prayer and fasting creates the new wine skin that can hold the new wine, and allows us to be clothed with the power of God. It now comes as no surprise to me that the first miracle of Jesus was the act of changing water into wine at the wedding in Cana. The Jews at the wedding washed in the water pots for purification. Jesus, however, drank nothing but the water of purification for 40 day before he attended the wedding. He didn't need the purification, but He needed to be clothed with power. His first miracle showed the servants of Jesus carrying the water of purification to the guests of the wedding, and as they served the guests, the water became wine. The water of purification on a 40 day fast becomes the new wine of the kingdom of God, which can then be administered to those who need salvation. The 40 day fast is the secret weapon of the kingdom of God, the key that opens the heavens to all those who want to serve the Lord in power. All of the Church ought to know the incredible "doctrine" of fasting and this is an amazing resource for just that, as it is an easy and quick read. It has inspired me to fast because of all the incredible testimonies, and the teaching on all I am able to receive through fasting. I long to know God and His love deeper, and walk in power, just like Jesus did, and I have been feeling for a long time now that fasting is what I need to step into this. The Word says WHEN you fast (not if), and IF you sin (not when). We seem to have it backward, and I don't want this to be the case! Let's all walk in the Spirit and not in the flesh, so that we may have life and life abundant, and have the ability and zeal to share that same Life and Love with everyone we meet! This book challenged me to pay special attention to fasting. After reading, I have a deep desire to fast and go deeper with God. Any book that provokes me to sprint after God like never before will get my 5-star rating. This book does that. Read it in faith that Jesus Christ paved the way for us to live above and beyond the natural limitations of humanity. I pray you will be blessed and begin to fast and pray. Love. 5.0 out of 5 starsfasting is the way to release the power of Jesus. We live in a day when it is absolutely necessary for every believer to function in supernatural power. Everyone of us! Fasting is the only way to come into that. This book is anointed. I started reading it and started a 10 day fast which I am on day 8 now. I feel clearer, more sensitive to the Lord and my faith uncapped! One knows they should fast but I just couldn't muster the willpower or gumption. But this book imparted to me an empowering grace to do this extended fast. I've had phenomenal grace. Get this book if you want to go deeper.